We consider ourselves a well rounded guide service, however we built our name and our business on guiding upland hunts. 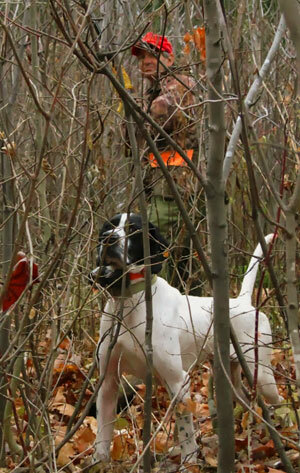 We train hunting dogs professionally all spring, summer and fall and are in the woods every single day. Our familiarity with bird habitat, numbers, and the methods and styles with which to hunt them is unparalleled. Having hunted and guided in this specific area in Maine for the last fifteen years we have a variety of coverts to pick from and pair with your dog, your hunting group, or yourself if you’re coming up alone. With hundreds of thousands of acres of wilderness, finding a piece of covert that is out of the way is our goal, as is locating birds that are not dog or human shy. Our Elhew bred English Pointers are some of the best in the region and are run on grouse and woodcock exclusively all year except for when snow depths prohibit us from accessing coverts. Our finished dogs assist us in training client dogs, and by the time hunting season arrives each dog is in peak physical shape, emotionally balanced, and intellectually prepared to work for you during your hunt. Our guides take the same approach and pride themselves on very much the same criteria. In the event you own your own dog or dogs we would welcome all of you for as long as you’d like to hunt them during your stay. Typically we bring other dogs as “back-up” in the event you’d like to rest your dog for a portion of the day. Depending on your preferences we can make a variety of dogs available to you – field bred English cockers, finished pointers, or dogs of either breed that are in development. A note regarding the number of birds we see per day, as we’re asked this question often. 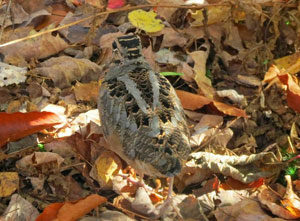 Please keep in mind that this is wild bird hunting, and that weather, migration of woodcock, and a host of other factors all contribute to how many birds we see each day. On tough weather days, we’ve seen fifteen flushes. On a decent day with solid dogs, and a day that I consider successful, we see between thirty five and fifty flushes. We’ve also had days where all of Mother Nature’s components clicked and we had ninety seven (2012) and ninety three (2011) flushes in one day. As they say, that’s why they call it hunting. To us it’s about time afield with hunting dogs, seeing the beautiful country that exists up here, getting your boots muddy, and developing friendships that last a lifetime.